With many hands, we do our best to serve where we're needed as we do the work Christ has given us to do. In 2016 St. Peter’s began Just Lunch, a program designed to provide lunch to high school students that could not afford lunch, forgot lunch or just needed a safe haven at St. Peter's. Just Lunch is a community labor of love and is staffed by volunteers from the community at large. Volunteer opportunities are available. Please contact Katie Longbrake to learn how you can help. If you would like to donate to the Just Lunch program, click the link below. "I like the friendly environment and we feel like the staff care about us. Friends who can't afford to buy lunch or forget to pack lunch get to eat without feeling embarrassed." St. Peter's Mother's Day Out is a ministry that reaches out to stay at home parents, parents who work from home, and parents that work part time in our community. Children 6 months old to 5 years can attend. St. Peter’s Early Childhood Program is a non-profit organization dedicated to providing children quality learning experiences, while cultivating their spiritual awareness. This is an opportunity for growth, fun, and learning to love each other the way God loves us and to care for and respect his creation. St. Peter’s hosts a community dinner every other month which are open to the public. Our hope is that they provide a place for the community to come together and celebrate our common bonds as well celebrate the diversity of Poolesville. While we gratefully accept donations to offset the cost of the dinners, they are free to anyone who needs a meal. 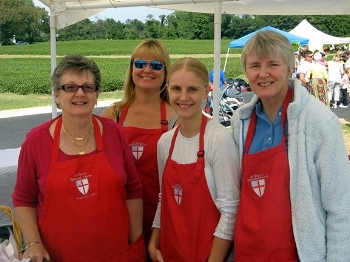 The Women of St. Peter’s (WSP) sponsor rummage sales twice a year that benefit our parish and community at large. Originally intended as a fundraiser for the WSP's various service projects, our rummage sales have become a parish-wide labor of love. We recognize the need for folks from all walks of life, especially those with limited income, to shop for their families with dignity and respect. Proceeds from the sale fund many of our outreach efforts as well as support our operating budget. In addition to the two main sales, the WSP also conducts a Christmas Attic rummage sale in early December, as wells as book sale in the spring. The community outreach projects featured above are only the most visible ways St. Peter's supports the community. Some of the other ways include: the Rector's Discretionary Good Samritan Fund Ministry, Helping Hands, Habitat for Humanity, Rebuilding Together, Thrift Shop and WUMCO (Western Upper Montgomery County). For more information on these programs please contact us.